At OSPS You Can Count on Us to Keep You Safe. We set the safety bar very high! For more than 20 years we have managed hundreds of safety projects all across the country. Our Outside Safety Professional Services team specializes in work zone safety for telecommunications construction and maintenance crews, utilities, municipalities, engineering and construction firms. Our ATSSA Certified Flaggers and supervisors provide a safe and secure working environment for our customers. 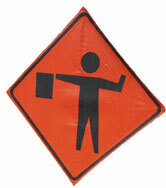 We minimize liability and facilitate work zone safety for the benefit of the public, construction crews and traffic. Are ready, willing and prepared to respond to emergency situations. Understand diverse types of situations and how to work with them. Effectively communicate with customers and co-workers. Are qualified in how to handle difficult and challenging drivers. Communicate instructions in a direct, specific and courteous way. We are Committed to Safety. Each job is reviewed for unique safety requirements. Each Flagger has Proper PPE, including fluorescent vest, safety glasses, hard hat and signs, flags and other directional equipment specific to job requirements. We apply proven safety practices to ensure the security of pedestrians, travelers, workers, and operational equipment in all types of weather, on state and local roads. We are flexible. We can schedule short term or long term commitments and respond to last minute or emergency requests. We also offer On-Site Flagger Safety Training with Certified Instructors. As a strategic partner, our disciplined approach to safety saves you time and money by controlling cost and by providing a dedicated workforce to supplement your current staff on an as needed basis. When signs and barricades are not enough for your employees, for project workers, or for the public, OSPS ensures pedestrians, workers, vehicles and equipment maintain a safe distance through traffic and work zones. Do you know what’s around the curve? Let OSPS protect your crews and the public.